Here is a recap of my all-expense paid mystery weekend adventure with Chasing Sunrise, MEC Nation and a group of hand-picked strangers. It’s 6 a.m. and the sun is already shining, as 50 strangers slowly start to gather at a meeting spot that was revealed the night before. Despite the early morning hour, there are smiles all around the crowd and a quiet excitement that comes to life as we all load onto the bus into the Unknown. Only a handful of people knew each other prior to this morning, but you wouldn’t know it with the buzz of conversation around the bus as well as the natural comfort and warmth permeating throughout. By the time we reached our pit stop in Chilliwack (we still had no idea where we were headed), it was evident it was going to be an unforgettable weekend. After about three hours of travel, which flew by thanks to the friendly chatter, energetic music and a plethora of snacks, we arrived at our group campsite at Lightning Lake in Manning Park. 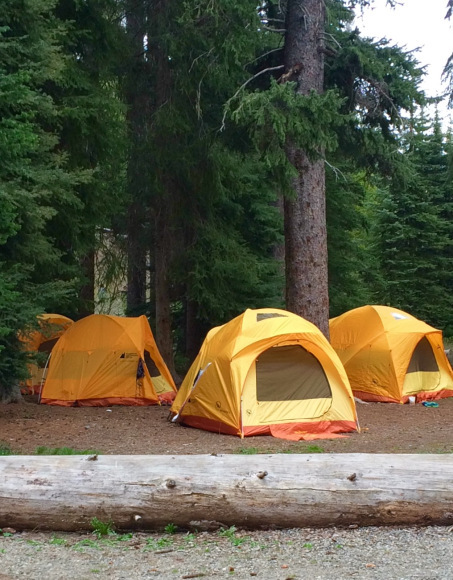 To our surprise the campground had already been set up for us—colourful yellow tent stocked with sleeping pads and sleeping bags, all provided by one of the wonderful sponsors Mountain Equipment Coop (MEC). We were also instructed on how to use our new water bottles from LifeStraw to drink water from the lake. Yes, I said it, from the lake! This wonderful invention allows you to simply scoop up water from essentially anywhere and drink it. It is beyond amazing! Once everyone located their bed for the night and put away our bags, we gathered to play some icebreaker games, much like those you would play in summer camp as a kid. A couple intense games of Rock, Paper, Scissors ensued and each round of friendly competition was met with high fives and an eruption of laughter. After playing another game that involved yelling and falling on the ground, everyone took some time to check out the campsite and lake, set up hammocks and fill up a kiddie pool with some amazing teamwork. A couple brave souls (myself included) took a dip in the freezing lake, while others lounged around until we were called for lunch. Excited for food, we all lined up outside of the camps mess hall, where the amazing Fuel Your Fire pair had created the first culinary masterpiece of the weekend. I am still in awe at their efforts at feeding all of us! After filling up on a delicious paleo meal, the group walked the trail around the lake, which opened up to large fields riddled with gopher holes. 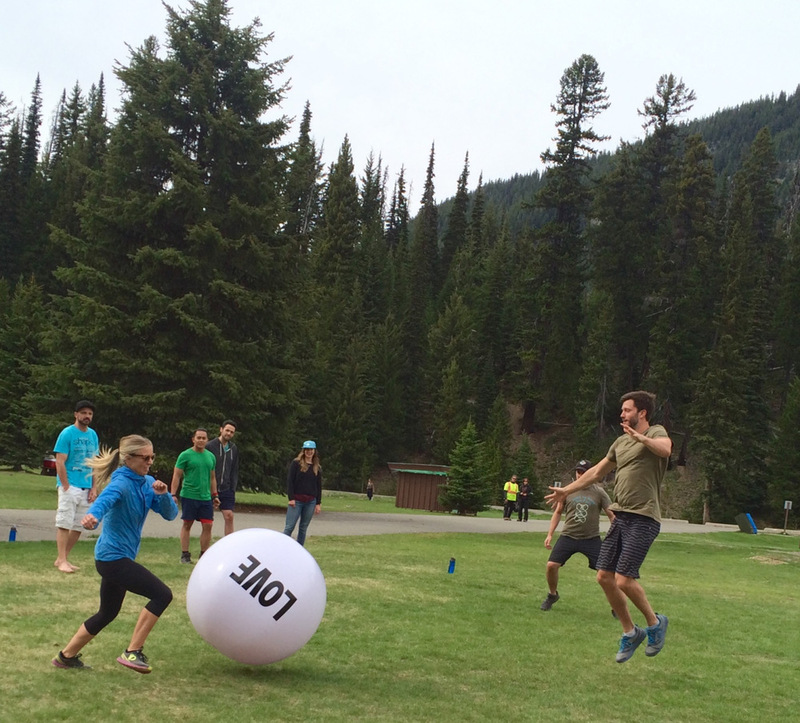 Some of us hopped into canoes to explore the gorgeous lake, others took an icy dip and more games were played, including capture the flag, ultimate Frisbee and an intense game of California kickball, played with the giant inflatable Big Love Ball. Watching a group of adults running, diving and laughing until their cheeks hurt was not only hilarious, but heartwarming. Unlike summer camp for kids, Chase Camp was equipped with beer and wine – which was chilled in the lake (nature’s fridge). 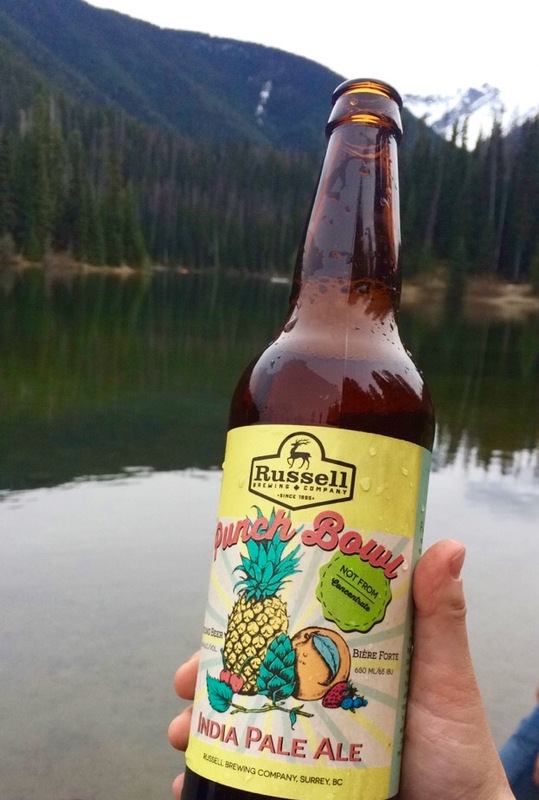 Most of us lounged lakeside, chatting and enjoying some delicious beers from Russell Brewing until dinner was served. And what a meal it was! Pork chops, a butternut squash and roasted apple medley and some fresh, crunchy coleslaw. Each person that entered the mess hall emerged with a massive smile on their face and a plate stacked with goodness. As the darkness began to set in, everyone started migrating towards the campfire. To our delight, the mess hall was now equipped with all the ingredients to make s’mores and our amazing guitarist for the weekend, Derek Pitts, was already strumming the tunes fireside. The cheersing of beers and singing of songs ensued well into the night for some, while others tried to catch a few hours of shut-eye before our early morning hike. When 2:45 a.m. rolled around, everyone slowly emerged from their tents, still dazed in the darkness. As our eyes tried to adjust to our pitch black surroundings, we were supplied with granola bars fromVega (another one of the amazing sponsors) and bottles of fresh juice. Piling into the bus, we were shuttled to the base of Cascade Lookout, where we began our 8 km hike up to the top. As we ascended the winding road, daybreak created a sense of urgency to those that still had a ways to go. Luckily, everyone managed to reach the lookout in time to catch the sunrise and as each small group of hikers rounded the final bend, they were welcomed with the scent of freshly brewed coffee and bacon. To our delight, the Fuel Your Fire duo had gone up the mountain early and began cooking breakfast well before we made the ascent. It was magic! Being greeted by a group of smiling faces, delicious smells and pink clouds made the long chilly hike completely worthit. Again, Kyle and Laura, you are our heroes! As the sun began to reveal itself over the horizon, nothing in the world below mattered anymore. The temperature at that early hour was low, but the spirits among the group of were as high as the mountaintop on which we stood. This moment of calming beauty washed over us, as did the sparkling sunlight. There is something so magical, something that words just cannot describe, about watching the sunrise with a group of people who were all strangers less than 24 hours prior. Catching the sunset is a common spectacle, and although it is beautiful in its own regard, there is something so magnificent about watching the sun come up while the world below is still asleep. To share that beauty with this group is something none of us will likely forget. After the initial awe of it all, devoured our breakfasts and huddled together to stay warm as we watched our fearless leader do frightening handstands on the edge of the lookout. We posed for a group shot before descending down the mountain and headed back to Chase Camp for a much-needed nap. Many of us opted to bring out sleeping bags down to the beach to enjoy a communal lakeside nap, which was an adorable sight to say the least. If partaking in games and singing by campfires wasn’t enough to evoke our inner child, designated nap time definitely drove that point home. After catching a little shut-eye, we headed up to the mess hall to enjoy our final meal at Chase Camp; another culinary delight served with a smile, that left us all satisfied and blissful. All that was left to do now was take down our tents and relax until it was time to journey back to reality. As we boarded the bus, it was clear that lifelong friendships had begun this weekend as new friends chatted about the fun times we had, made plans for spending time together in the future and passed around whatever snacks we had left. The buzz of conversation continued and the relaxed, sleepy smiles remained until we arrived back at the MEC head office. It was time to say goodbye. Reluctant to part ways with our new friends, everyone took turns exchanging hugs and promises for future hangouts until the last goodbyes were made. However, even though we had to say goodbye that evening and face reality once again, the lasting impression this weekend had on every one of us will never be forgotten.